This project kicks off a whole new set of fun! While I was doing some inspiration seeking for this series of kiddo furniture, I remembered something from my own child hood. When I was about 10 or 11, I picked out a bedroom set that was modular furniture with all sorts of storage and rearranging options. For me and my A-type personality, this was the most amazing fun. I would sit for hours trying to decide on the most perfect organization for my stuff (ok, so I was the strangest 10 year old known to man, but design has ALWAYS been in my blood) and how best to set up vignettes of all of my pretty things and toys for display. I never did much playing with toys for me it was always about how they would look out on display and arranged with other things. Alright so as I put this in type, I am realizing just how truly weird I might have been (still am?)! But, the point remains… I found some fabulous inspiration for toddler to young adult rooms that will keep your kiddos happy for hours on end, and allow them the fabulous creativity of designing their own lives just as I was able to do! This is just one piece of the pie. I will be creating dozens more over time and you (and perhaps your child) can determine which you like best and which fit your lifestyle needs most. I want bold and fun colors people! If you aren’t sure how to pull that off, send me an email, I respond quickly (unlike other bloggers I know…ahem!) and I am glad to put my passion to work! Bold and fun are well balanced with neutral and sophisticated colors. I am not talking primary colors folks…let’s just pretend that is a thing of the past, shall we? A sheet is typically 4’x8′. ** Optional – Qty 6 – 2″ Casters – plastic will work fine or you can purchase casters with a break as well, to hold the table in place when desired. Note: If this table is too large for your space, you can alter the length or width of it. Just make sure to allow for that in the remainder of your cuts. **If you plan to add casters, consider altering (lowering) the height of the Cubes and the Legs by 3 1/2″ or so to keep this table low enough for young children. If your kiddos are older this is likely not necessary. Build the Leg and Bottom and Sides of Cubes: Use 2″ Screws and Glue. 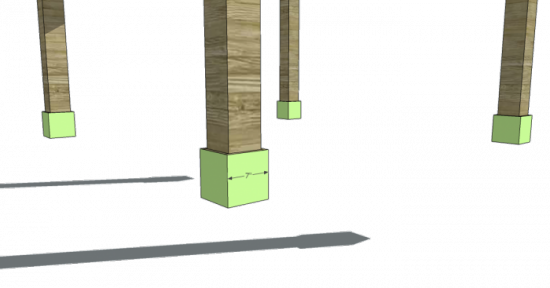 The outside of the Leg and Cubes will sit 3′ apart from outside edge to outside edge. The dimensions are shown below. Attach the Top to the cubes: Use 2″ Screws and Glue. Attach the Table Top to the Leg and Cubes: Use 2″ Screws and Glue. 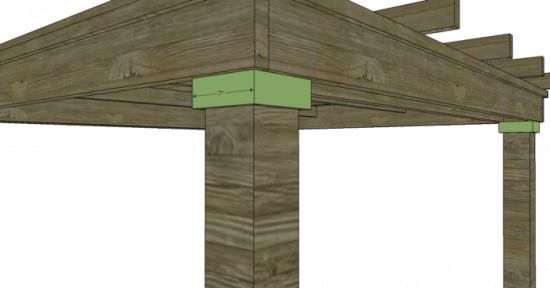 Attach the Trim to the Table Top allowing it to extend 1″ above the top of the table top. This will create a lip to keep those toys and fun contained! Use 1 1/4″ Screws and Glue. If you plan to add casters, you can add them as indicated by the circles below. Might I just say that doing a nursery design plan was oh so very fun and exciting. My little one is 3 1/2 and I can’t believe the amazing new gear they have come out with, just since his birth. Trust me when I say it’s enough to make me think my second child may be in the works, sooner rather than later (maybe). When Marilyn sent me some pictures of a media cabinet she recently finished, using my Finishing School Tutorials, I had the chance to hear her story, and it broke my heart! She mentioned that they were in the process of finishing their home, which was being built for the second time, and constructing some of their furniture pieces, because they lost most of their belongings (if not all) in a fire. She was 6 months pregnant with her second child at the time and had to scramble to find living quarters for her family, 2 large German Shepard doggies, and a 3rd pup. I am surprised she was even able to accomplish that! Good thing she doesn’t live in CA, that would have been almost impossible! Now that their home is well underway, they are frantically trying to wrap up loose ends before their 3rd little one is to arrive in the next month or so… That’s right, she is 8 months pregnant with her 3rd and in need of a proper nursery for the soon – to – be arriving, bouncing baby boy! I hope they finish the bathrooms before he arrives, that would be extremely inconvenient, would it not? She has given me some descriptions of her sense of style, and wouldn’t you know (though she wasn’t completely aware of this) it fits some of my favorite aspects of Farmhouse style to a T. She sent me some images of fabric styles she has purchased, and well, they are swoon worthy! She is planning on sewing curtains, sheets, laundry hamper, boppy cover, etc. You know I am a huge fan of DIY and Handmade anything, assuming it has the benefit of being safer, more organic, or less expensive! Let’s get down to business, after all she doesn’t’ have much time left! 1. Really this item is self explanatory, however my thought of late, is that there are some items, like stuffed animals, that are really better displayed and stored out in the open. 3. This is a tree wall decal, and can also be done with paint and even a singular color on an open wall. This can be used as an example and doesn’t need to be perfect. A light shade of gray or a grayish brown would be amazing. 5. I love this mobile, but it does happen to be birds. It would go well with fish but she could use it as a guide and create her own with fishy hanging objects instead. 6. A variety of these would add visual interest as well as functionality to any room. 7. This nightlight is just simply fab! I have this and Blake absolutely LOVES it! He likes to carry it around and sleep with it. It is budget friendly, uses regular easily purchased batteries and the color is amazing! 8. Cutest little orange mod circle swaddlers. 10. Disguising fabric on a chair, if you don’t love it, can easily be done by adding a simple throw over the back and some pillows. If you try and get fancy by draping the throw and all that other cutesy stuff, it will look like you are disguising something and not doing a very good job. My suggestion is to keep it simple. Reupholster, slipcover or just pile on the goodies! 11. This sleep positioner is not something tha tis 100% necessary for everyone to have, but since she will be refinishing her crib, it might be a nice solution until she is finished with that project. 12. This set of 2 would allow her to use one in another room (her own or one of her older boys). I love the idea that it is natural material but has a lining that might possibly be taken out and carried to the laundry room! 13. She wanted to make this room something that expressed her family’s heritage. Living in Alaska, while I don’t know a ton about the environment, something about this cute little Moosey just struck a chord for me. Plus the color is fabulous and its a great way to hang cute baby blankets or coats and hats. 15. Wooden toys are all the rage, and after seeing this amazing Baby Gym at Ikea along with the amazing price tag…I’m sold! 16. Little Tree Bedding Set. Can be purcahsed as a whole, individually, or can be used as inspiration for the fabrics she has and how to arrange them. I particularly love the coordinating artwork shown, which she may be able to create using left over scraps of fabric! 18. An optional baby bumper that can be purchased on it’s own should she not care to make one or purchase on in a set with other bedding pieces. For those of you with children, this is an awfully familiar scenario, is it not? It is often times difficult to know what to do with a playroom that is in the direct line of site from the main living areas of the house. Not only does it need to function as a playroom that your children will actually enjoy, it also has to “appear” adult friendly…at least visually. As you can see from the pictures below, this amazing playroom has fabulous windows and should function fairly well being within reach of the family room. Theoretically this should be a home run. But…kids are funny, and if a room isn’t something an adult would want to spend time in, chances are you will find your kids migrating away from the room as well. This is precisely what happens in Allison’s home. Her kiddo’s rarely actually play in this room and most play dates become awkward with the adults ultimately ending up sitting on the floor. 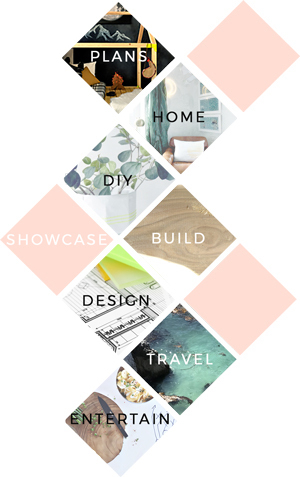 Also as an Update: From the time I created this Mood Board and suggested she rehab Craigslist finds back in May of 2010… Allison has decided she in fact loves it, and now has her own site that focuses on exactly that! Yahoo… You can visit her here: Fab Rehab Creations! You can see how this playroom is visible from the family room and as this last picture indicates… from the Dining Room as well (though you don’t actually know that is where we are standing until I mention it), what you can’t see is that is also directly visible from the moment you enter the front door. But before I get into the details please know that while it appears this room has a beautiful feminine charm about it, I assure you that once we break it down a bit, you will see it actually does not. My inspiration pictures have some feminine seeming pillows in it, and the version I would like for her is a little less feminine and more focused on nature. 1. This picture from West Elm started my inspiration for this project. What I am most loving about it is the mix of the natural wood with simple graphic printed pillows in white, beige, gray and green. I think this color combo mixed with black furniture will be amazing in this space and not conflict with her family room color scheme. Because this is a playroom it will naturally be filled with toys of various colors so that is important to keep in mind when designing. A color scheme needs to be chosen that will work well with spot of cobalt blue, red and grass green. This will be fine under that assumption. In fact it will thrive as such! 2. I would love to see this room be a light to medium shade of green with some yellow undertones. It should be a nice compliment to the colors in both her family room and dining room and will be calming and natural feeling in the playroom. She could use a teeny tiny drill bit to pierce each stick and stack them on some extra thick fishing line or nylon string. Think jewelry making supplies or hardware supplies for this…It will bring a fabulous natural element to the room. The more they collect the more stick lines they can produce in varying lengths. To attach to the ceiling she can purchase a small bag of hooks that screw in. See my chandelier hanging escape for the type of hooks I refer to. She should either spray them white to match the ceiling or purchase them in white so they blend in and appear seamless. She can nang them in a line or in a grouping like a crystal hanging chandelier. 4. I think 2 of these pendant lights from West Elm would be amazing on either side of the over sized chair in the window area, or on either side of the daybed. Pendant lights are a much safer option with small children, but of course wrapping a cord is fine as well. A set of 2 is $179 so not cheap, but consider that she doesnt’ have to buy any furniture and only the supplies to build with, this room will come together for next to nothing! 5. She has 2 bookshelves which I have suggest she paint black to tie together and unify the room. 6. She already owns the cutest little wooden table and chairs sized for kids, and she can either paint it black to match the furniture or she can leave it as is ( a honey colored stain) and it will compliment nicely. 7. This is her play table and I suggest she leave it white to bring some brightness to the room, she could also paint it black if she prefers that. 8. I think a collection of chalkboards or cork boards would be fabulous in here to display artwork or to color on for her kiddos. the colors of both chalk boards and cork boards would be perfect in this room. you can purchase cork boards fairly inexpensively, in fact I recently purchased a couple from my local dollar store. 9. This artwork is super cute from West Elm and can absolutely be purchased, but I think it could also be tackled by printing a clip art image made white on gray paper so easily…I mean really easily…I also think that in addition to printing out clip art and framing it, she could find plants and leaves from the yard (or her neighbors) and print using the same technique in this tutorial: Garden Party Printed Pillows She would just need gray and white paper and white white and beige paint. She can use the white paint on the gray paper and the beige paint on the white paper and place them in black frames and it would be quite fab! 11. These prints can either be just that, prints or this is really an interesting idea for the chalkboards. If she simply painted 2 plywood boards after sanding them well, with chalkboard paint and the attached picture hanging apparatuses on the back, it would be simple and yet make a statement. Two of these long and narrow would be amazing on the short wall to the left of the bay window. 12. This rug can be found at West Elm and would really bring the room together if placed under the daybed. It would help draw the eye to something pleasant and amazing from the font door view. Any rug of a decent size and with a natural feeling to it would work well here and the discount stores should definitely be checked along with resources such as Craigslist. 13. This daybed represents any daybed with a wooden frame. 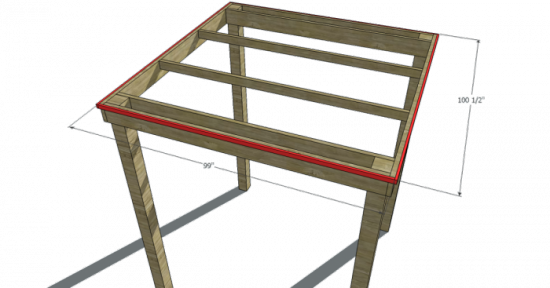 I will be posting plans for a simple and graphic daybed this week (can be found here). She can also search places like Craigslist for options that are reasonably priced and simply paint them black. I hope I haven’t forgotten anything…but if you notice I have, let me know..my mind is very busy and tired today..hahah I guess we are all entitled to a bit of crazy now and then, no? This piece speaks for itself but just in case it doesn’t…it’s a modification of the popular 2×2 One-Armed Daybed. 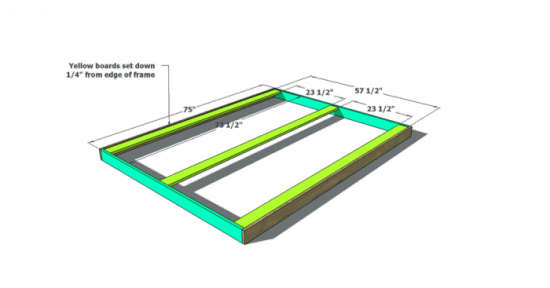 This plan allows for a standard Full Sized Mattress and I have to say, I am really liking the way it looks! I was not sure how it would turn out aesthetically until I actually sat down to modify the plans…and I am smitten with it! This Daybed will fit a Standard Full Sized Mattress of 54×75″, so unless you desire to…no special sewing is required. 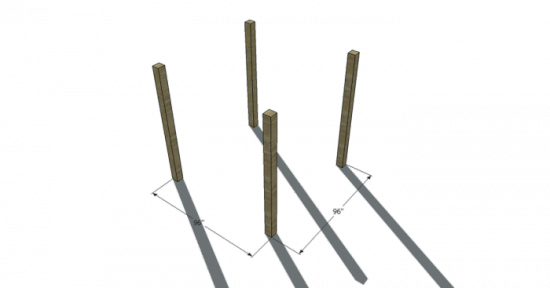 Attach the Rails to the inside of the Legs: Leave 3/4″ Space at either end and use 2 1/2″ Screws and Wood Glue. If you plan to take this apart, skip the glue. You can also use carriage bolts for this by drilling all the way through the rail and leg with an appropriately sized drill bit for the carriage bolt. 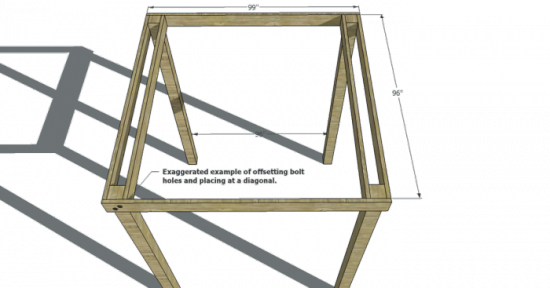 The top of the Frame Rails should be flush with the top of the Shorter Legs and 6 1/2″ from the bottom of the taller legs. Attach the Stretchers to the Cleats: Use your Kreg Jig on a 1 1/2″ setting and place Pocket holes on the inside of the Stretchers. If you aren’t using a Kreg Jig, use 3″ Screws from the outside of the cleat into the stretchers. 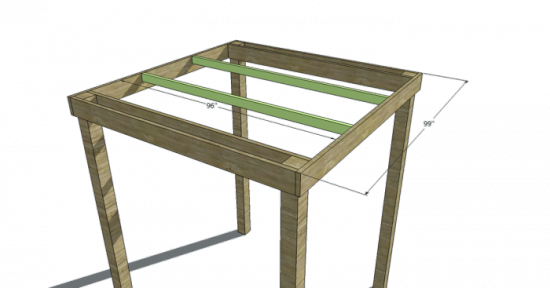 THEN Attach the Cleats to the Rails: Use 2″ Screws and Wood Glue. Attach the End Aprons: Use 2″ Screws and Wood Glue and fasten into the rails, cleats and stretchers. If you are using a Kreg Jig, you can also fasten the End Aprons to the Legs. 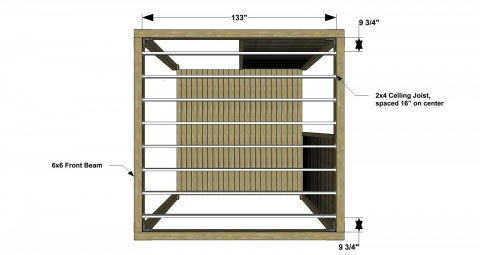 Lay the Slats approximately 6″ Apart and screw in place using 1 1/4″ Screws. Do not glue the slats if you plan to remove them at any point. Attach the Back Rest (Green), then attach the Arm Rest (Red). Place Pocket Holes as indicated in the diagram below. 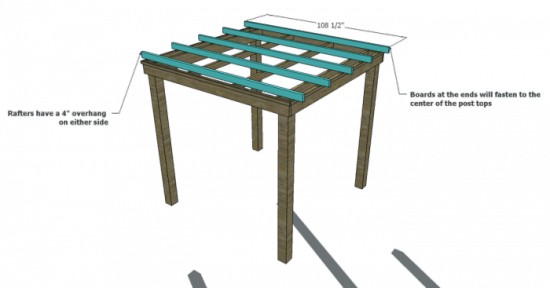 If you aren’t using a Kreg Jig, use 3″ Screws and Wood Glue. 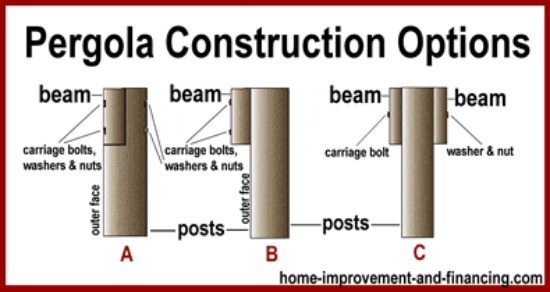 Then attach the Front and Back Aprons: Use 2″ Screws and Wood Glue. This Mood Board will focus on all things Traditional, with a modern twist of course…I mean, this is the year 2011! What would we be if not modern, with a tinge of the past… of course! Today I used items from Ballard Designs, Z Gallerie, and Ikea. Each item is available for purchase (click on each link for pricing info) and throughout the month we will focus on how to achieve this Look 4 Less! This is a project anyone can do! Sandy from Mi So Happi has been kind enough to share her amazing talents with us, by walking us through the steps…thanks Sandy! Please visit her shop to see her wares, you will be glad you did! If you aren’t an experienced seamstress, or sewing isn’t your thing, you can modify this project to be a no sew pillow with pretty applique. Just use Fabri-Tac or another such fabric adhesive and simply glue along the lines where you would normally sew (you will probably have to skip the button though, if you go this route, but no worries, it will still be fabulous). 1. 2 contrasting but complementary fabric choices. See exact measurements and layout below (cut measurements add up to 21″x63″ for main pillow fabric and 6.5″x6.5″ for contrasting applique portion). 2. Fabric paint that is appropriate for your choice of the ‘applique’ portion of your fabric. 3. Plant sprigs: rosemary would be nice, or any stem from a shrub with a few leaves. Just look around for something with enough of a surface to apply paint. Get creative here! 4. Embroidery floss and needle, for creating a contrasting stitch, around the outside of applique. Sandy has chosen a beautiful red which looks wonderful and stands out against the linen backdrop and misty green leaf sprig prints. 5. Sewing machine and thread in a similar color to your main pillow fabric or Fabri-Tac (or any other brand of no sew glue). 1. Begin by finding leaf or stem plant cuttings you enjoy and that have a nice surface for printing. 2. Cut out the fabric for the applique portion of the pillow (see below for measurements). 3. Prepare your paint, either by readying the color you plan to use, or mixing colors to achieve your desired result. Sandy mixed royal blue, yellow and white to get to this beautiful Misty Green color. I just love it (and just realized it matches the color of my title perfectly, yay)! Remember to use fabric paint that is appropriate for the fabric you have chosen. 4. Coat one side of your leaf sprigs. Make sure you have adequate paint on your sprig to transfer the image onto your fabric. Don’t apply so much that it’s drippy or smears when you apply any pressure to your sprig (a little smearing is survivable, a lot will mar your image too much and not achieve the graphic result desired here). As you can see from the image below there is something quite charming about having the paint transfer be a bit spotty and imperfect, it gives it a weathered sort of feel. You might want to practice this step on a piece of paper a few times before going ahead with it on your fabric. Get the desired amount of paint and pressure determined beforehand. 5. Once you have your paint and pressure practiced and determined, go ahead and stamp your fabric. Using a few different sprigs in different lengths will give you a nice result. 6. Once you have finished these steps, you can move on to sewing (or gluing) the pillow while you allow the applique center to dry. The pattern for this pillow is below, click on the image to enlarge it. This is what it should look like as you progress. 7. If you are choosing the no sew method of creating this pillow, use the Fabri-Tac to apply the center applique as well, then use your embroidery floss to create a running stitch either along the edge of your applique (to further attach it to your pillow) or just outside and adjacent to your applique (this is up to you, you can also skip this step altogether if you want a really quick finish). If you are using a machine for sewing your pillow, you will then run the embroidery floss along the outside of your applique by hand. That’s it – so simple, anyone can do this regardless of your sewing experience. I hope you will all send me pictures of your version. I would love to see how you applied this to your own home decor. I’m pretty sure this area between my downstairs bedroom (my new office craft space, you can see that transformation here, here, here, here, here, here, and here) and it’s associated bathroom is supposed to be a linen closet, but I can tell you that I don’t have anywhere near enough linens to fill this linen closet, along with the much smaller one upstairs, and another one in the bathroom for the kids. What I do seem to have a lot of, and no where near enough storage for, is my china, serving ware, and glassware. Wow…and this does not include my everyday dinnerware and glasses. Enter stage left…linen closet turned butler pantry. I feel pretty clever to have thought of this, thank you very much! With the space above the bottom cabinet, I now also have room for all of the cocktail mix must-haves, and over sized wine and champagne bottles that don’t fit in my wine coolers. Make that 2 problems solved with one re-purposing of a cabinet. Being frugal and smart with your space doesn’t just involve how much money you spend on something, it also means finding appropriate solutions for the things you already have and making good use of them. There is nothing frugal about wasted space. If you have an extra cabinet or shelf, even a piece of furniture without a real direction in life, think outside of the box and put it to good use. Any designer will tell you that having smart organization is crucial in good design.